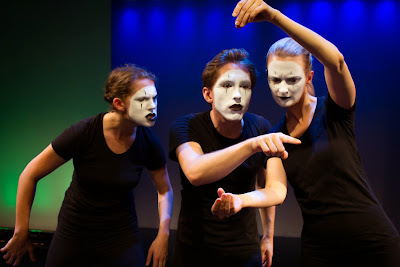 The art of Mime is alive and well all thanks to Broken Box Mime Theater. In their newest show, Topography, the ensemble explores the definition of the word through an evening of storytelling with an assortment of tales, personally and universally. As described in the program note, the world of Topography spans the stories, memories, and visions and the proximity between intimate and expansive. With sixteen various sketches to share, Broken Box Mime brings the art of physical and silent storytelling to the stage in simple yet stunning fashion. From three kids playing and living the world of "Dungeons and Dragons" to the journey of a couple to the hilarity of a secret handshake, Topography explores life through various lenses, giving the audience a unique perspective on the age-old slice of life. Though the overall piece could benefit from dropping a story or three, Topography is entertaining, providing you with every emotion in the book. To try to pinpoint a singular stellar performer would be unfair as the entire ensemble was one equally cohesive team. Broken Box Mime exemplifies the definition of ensemble. Though you can clearly tell the difference from performer to performer, there was never a weak link in the full company pieces. Yet individually, they each put their own personal stamp on their performance. Additionally, what makes each individual piece special is the clearly carefully selected music accompanying each story. Despite the eclectic mix of songs, they all worked well as one. Lighting designer Jamie Roderick does a phenomenal job giving each story its own colorful world to live in. The simplicity of the overall world in Topography truly allows for the work to come to life. Though it may not be everyone’s cup of tea, Broken Box Mime makes mime look easy and fun! With a well rounded ensemble and a remarkable spectrum of stories to share, Topography is an outstanding venture that is not to be missed.